The Art of Making Blog: I can't stop. 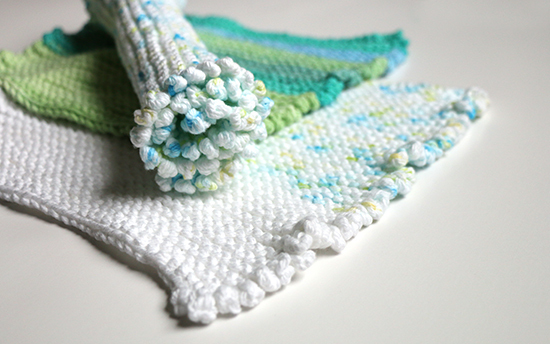 Lily Sugar’n Cream Ombre Summer Prints is a white yarn with flecks of yellow, green, and blue. Lily Sugar’n Cream Scents in the colorway Aloe Vera has lovely subtle shifts of light greens, but I didn’t notice that the yarn was scented when I purchased it. The fragrance is pleasant enough; it’s a sort of perfumed soap smell. I can be sensitive to scents and it made me sneeze, but the fragrance alone wouldn’t prevent me from buying the yarn again. Lily Sugar’n Cream Stripes in the colorway Country has long stripes of blues and greens. I expected more gradual color changes but I still like the overall look. The feel of the yarn is a bit rougher than a typical cotton yarn. 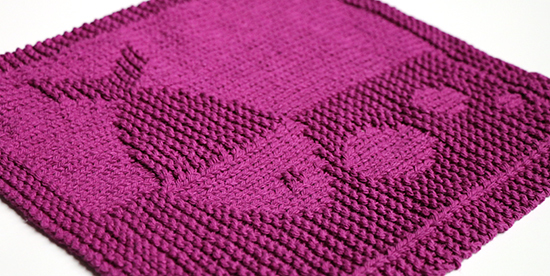 Lion Brand Kitchen Cotton in Grape is simply purple yarn. 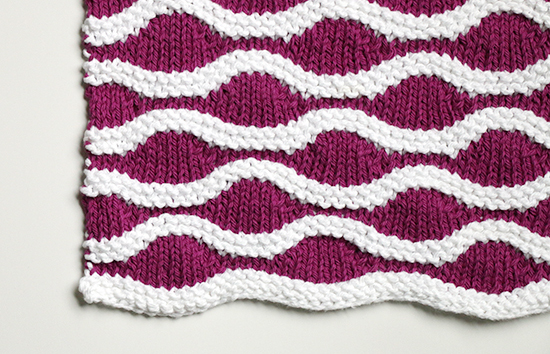 Nubbins Dishcloth by Vyvyan Neel is a basic pattern that is just different enough to be eye-catching. 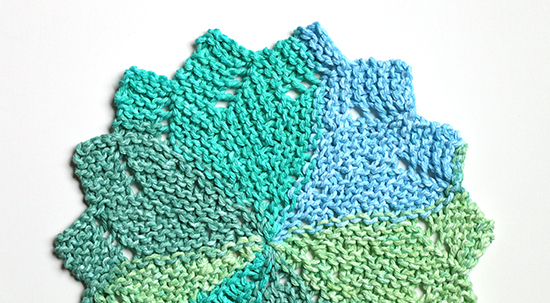 The simplicity of the pattern would work well with even the busiest of yarns. We had just watched “Mary Poppins” and I kept humming “nubbins, nubbins” to the tune of “Feed the Birds” (tuppence, tuppence, tuppence a bag). 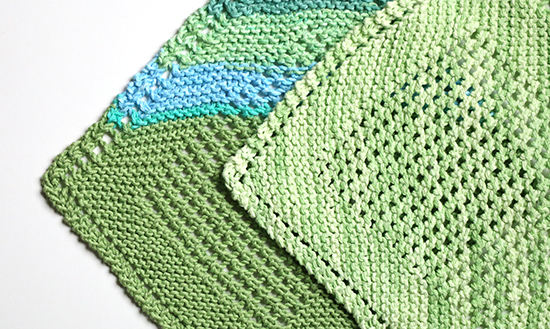 Diagonal Knit Dishcloth by Jana Trent is a variation on the basic Granny Cloth that is a good fit for solid colors or subtle color changes. I tried it with the striped yarn (below left) and think the color changes take the focus away from the knitting. Fisch Blubb - Spüli by Deborah 9 is a fun pattern that takes advantage of different stitch textures to create the image of a fish. While the cloth is adorable, I don’t like that it doesn’t want to stay square due to the row height variations. 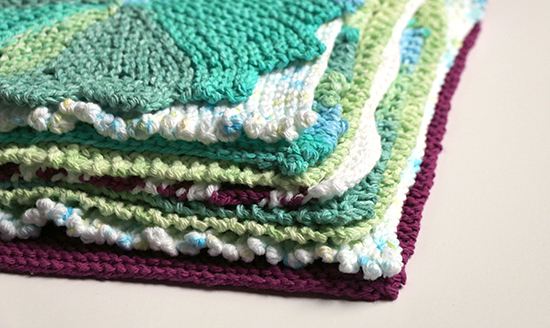 The Almost Lost Dishcloth by Julie Tarsha is another simple pattern that would work well with any colors. I didn’t like the fussiness of stitching the first and last rows together at the end, although the finishing was minimal with so few stitches. Lizard Ridge Dishcloth by Laura Aylor is the most complicated cloth pattern that I tried, yet it’s far from difficult with pattern repeats that are easy to remember. I was told my color choices make this look like a very wide slab of bacon. That wraps up the highlights of my latest bout of cloth knitting. I found myself in another chain craft store this weekend and managed to resist buying more cotton yarn. I think I’m up to twenty cloths in recent weeks; it’s time to move on. What projects keep you coming back?